Me, My Nails and My Nail Paints. I’m having a comfortable Monday at home, but still quite a busy one. What about you? The title of this post might be a bit funny but I just wanted to share some rambling about my journey with nail paints. I have not been a nail paint lover forever. In fact, I used to despise them when I was in school, I guess in 9-10th standard. I used to find them goopy and a pain to apply and remove. But somewhere down the line I didn’t realize when I fell in love with them. I have always been a fan of colours and all things colourful so nail paints can be called an easy way to indulge myself in colours. Initially in my early college days I used to hoard nail paints just too much. But only those local 15-50bucks nail paints. Mostly by Ebony, Nail Juice, Elle 18. I used to change my finger and toe nails almost twice a week and was in total love with the colourful nail paints. 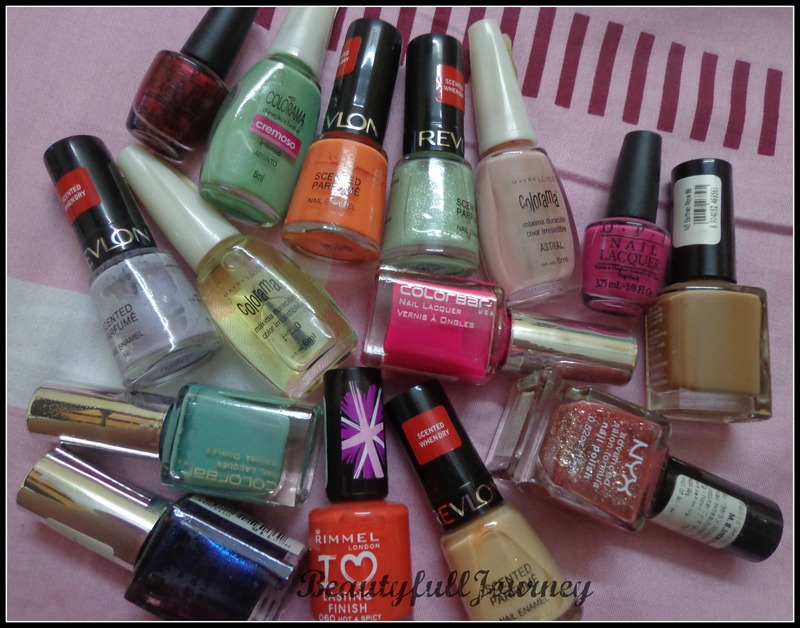 But slowly the craze mellowed down and I started experimenting with more brands and a little more expensive nail paints. Also, becoming a beauty blogger made me want to experiment as much as I could. So I started buying Maybelline, Revlon, Lotus, Colorbar, NYX etc etc. These nail paints are just a few random ones from my collection. I feel that since I have to change them every week, why spend a fortune on them? And to be honest, its only once in a while I fall in love with a nail paint so much that I repeat it often. 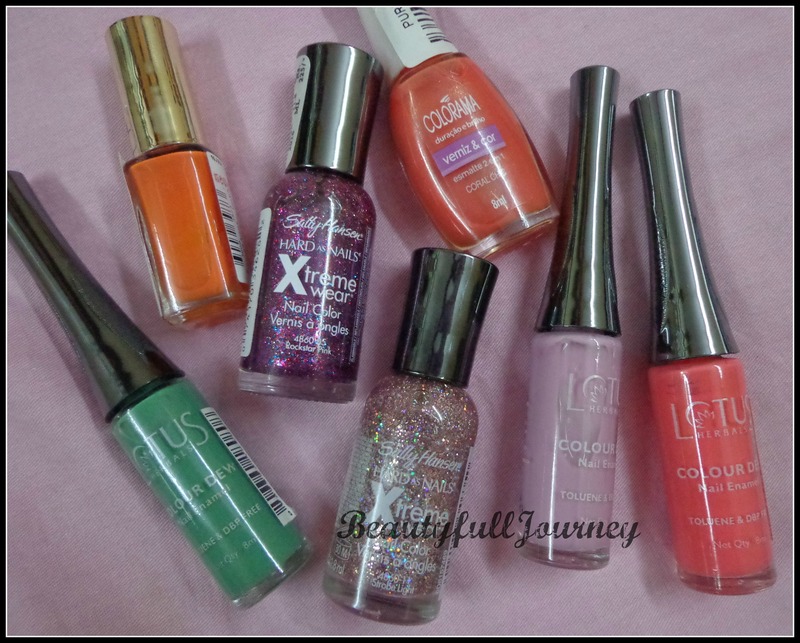 In the past 10-15 days, I have got these 7 new nail paints which I’m yet to use properly. Some are PR samples, rest I’ve bought. I’ve already showed you the Lotus ones here. How much do you spend on nail paints? Next > Forest Essentials Haul | Some chit-chat.